Hotel Breakers has opened its doors for the 2015 season sporting a brand new look. I’ve stayed at this 110 year old Cedar Point property on two other occasions and have enjoyed my stay because of the proximity to the park and the spectacular beach views, but always found the interior and rooms in much need of an upgrade. On previous visits, the rooms lacked personality. I could have been staying at any budget hotel (but not paying budget prices). The property was clean and the employees were nice, but overall, I can’t say that I was ever excited to return to the property for another stay. And when friends and family asked me for recommendations of where to stay near Cedar Point, I was likely to point out the perks of Hotel Breakers, staying at the onsite property meant early admission to the park, discounted tickets, and access to one of the best beaches in the area with the caveat that I felt the property was dated and a tad bit overpriced. 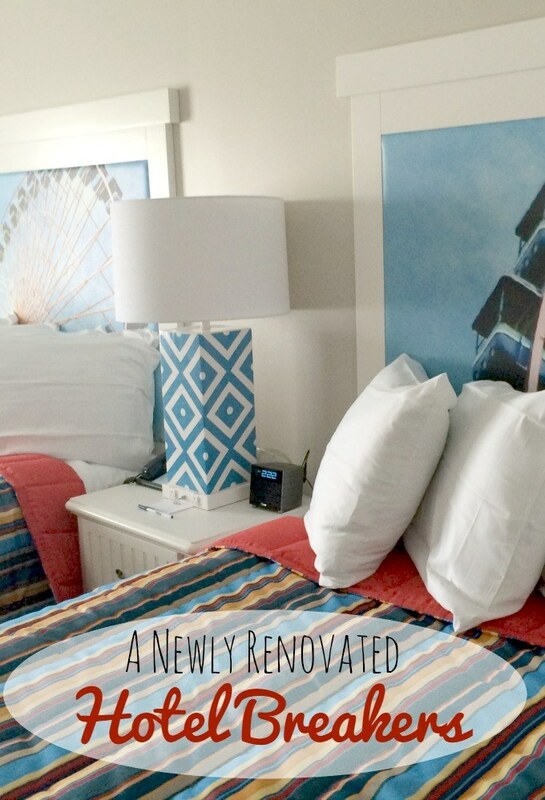 I was excited when offered the opportunity to stay at the newly refurbished property to see if Hotel Breakers could deliver everything that was promised with the renovation. It did. I was impressed before I stepped foot in the hotel. Though I knew I was at the right place, the entrance of the hotel was nearly unrecognizable. Gone were the steps one needed to climb to enter the property, replaced with a slight incline and automatic doors. The long hallway that lead to check-in smelled of fresh paint and carpet with prints on the walls of the carousel horses at Cedar Point. A gift shop with beautiful stain glass doors provides guests an opportunity to pick up items they may have forgotten at home while purchasing souvenirs of their stay. The lobby provided comfortable, stylish seating with a focal point of two full-size carousel horses. It was clear that I wasn’t the only one excited by the changes. The transformation brought a positive energy to the employees. Though they were always prompt and courteous in the past, I found them to be downright cheerful and a pleasure to talk to during this visit. It was clear that they are proud of the new look of Hotel Breakers. We quickly popped into the five-story rotunda that now features guest rooms, before excitedly hopping on the elevator. On the way to the eighth floor, my husband and I discussed how remarkable and extensive the renovations had been. In the past, I’ve paid for a lake view room but my disappointment at not being able to watch the sunrise from my room was short lived. The newly renovated space was gorgeous and perfectly encapsulated what I would expect a Cedar Point property to look like. I’m glad to see that the care given to the park now extends to the resort as well. Gone was the awkward, boxy television which was replaced by a modern, large flat screen TV’s. In-room refrigerators and microwaves are a great touch for families, and I loved the simple touches like the red chairs at the desk that matched the red ice bucket. Old park photos in the bathroom added a touch of nostalgia while the brightly colored comforters and headboards with images from inside the park beckoned me to leave the comfortable cool room and make my way to the resort entrance. After all, one doesn’t stay at Hotel Breakers and not step foot into Cedar Point, right? In the past, I would have agreed, but the care given to the historic property and added special touches make this a resort that guests will enjoy, separate from the amusement park. A new full-service Starbucks, Surf Lounge bar, indoor and outdoor pool & hot tub, outdoor water play area, fire pits, and mile-long sandy beach with cabanas and beach chairs beg guests to relax. 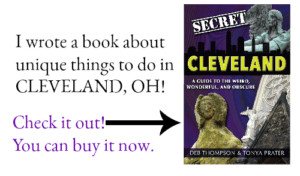 I found myself kicking off my shoes, digging my toes in the sand and wishing I’d packed a great book to read. It’s speculated that Hotel Breakers was renovated to the tune of $50 million dollars. Was it worth it? I say it was a good investment. After waking up after an incredible night’s sleep, I was sad to leave. 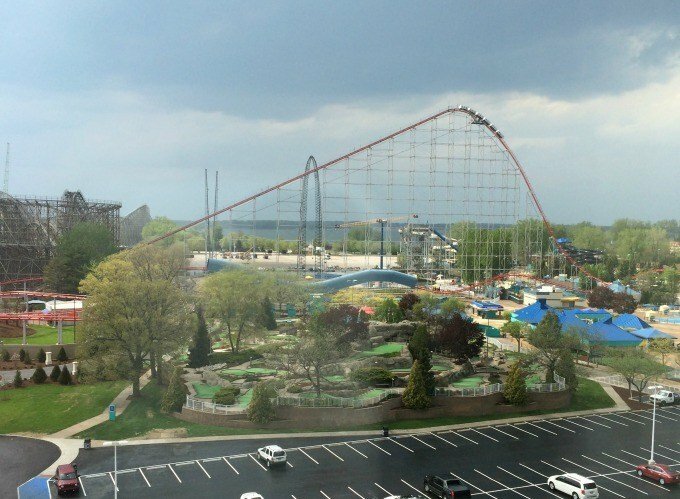 And it wasn’t because I was eager to ride more of the roller coasters I saw outside my window- as thrilling as those rides can be. Well done, Cedar Point. Well done. Cost: Prices in mid-July start at $284 for 4 adults in a standard room and go up to $684 for a room for 4 adults in the combination suite (two adjoining rooms) on the concierge level. Have you stayed at this property since the renovations? What did you think? 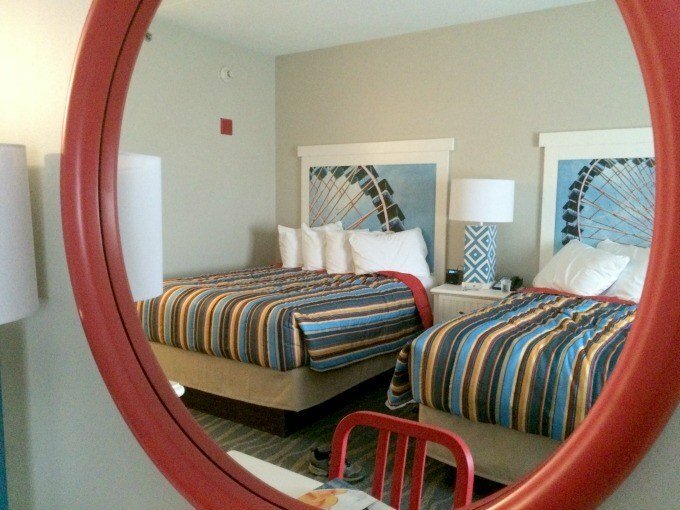 Disclosure: As a Cedar Point blogger, I received a complimentary stay at Hotel Breakers. All opinions are my own. That room looks very nice now. I don’t know what it looked like before, but I would enjoy staying there. I am so excited to hear this! 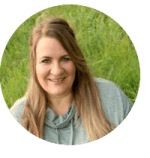 Headed there in September for Bloggy Moms conference. Can’t wait to see everything firsthand! It looks really lovely. I adore the bedspreads – so bright and happy. I hope to get there someday. What a beautiful room! I love those shade lounges, too! SO many pretty colors. I have such good memories at Cedar Point. I don’t think I’ve checked out that hotel though. It sounds so nice! Wow. Now that is some hotel! Just beautiful, every part of it. That is a place I would love to stay at with my family! Wow, what a beautiful place to visit!! Love the photos and would love to go there with my family! Wow, that is an amazing resort! I adore roller coasters, but it’d be hard to leave that hotel! It really looks as if they’ve done a great job – we’d like to stay here too! This looks like a great summer destination on a cross country road trip. Love the lakeside cabana-lounges. Sounds like the update is amazing! 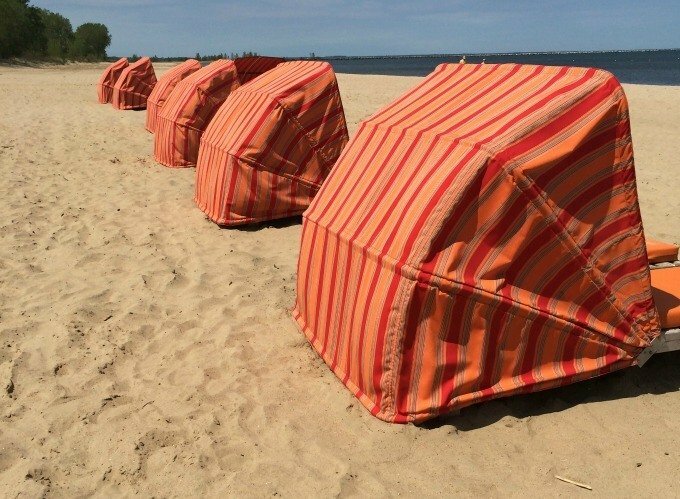 I love the cool and fun colors they decorated the room with and those beach cabanas look fabulous! I have never had the chance to visit, but would love to make it there sometime. Holy moly! What a transformation! It’s like it went from a scene in The Shining to a spread in Coastal Living magazine. Kudos to them! Wow -this looks like a really amazing hotel! I love the colors in the room and it looks like they really pat attention to the details! I think I need to plan a trip! That sounds amazing. I would LOVE to pack up my family and take them on a road trip there. How fun would that be? I haven’t been to Cedar Point before but the Breakers definitely looks like a nice place to stay! It is good to see that this property has been updated so nicely. Very cool new look. Can’t wait to see it. I love the colors in the room. I want them for our new house. I haven’t been to Cedar Points yet but I’d love to visit.